Yeh Rishta Kya Kehlata Hai 26th October 2016: Karishma applied mehndi on Naira’a hand, and by mistake, she got K on her hand. Naira did not let her erase K and looked at it. Akshara showed Naitik her Mehendi. He liked it and hugged her. She kissed him and went from there. Naitik asked her to have food. Nairaa came. Naitik feeds Akshara and stopped seeing the elders. Devyaani asked him not to be shy. Karishma was sad. Naitik said that he knew how she was feeling but she should keep the fast with devotion and he would scold her like a big brother only. He said that she was just like Rashmi for him. Rama feeds to Gayu. Naira too went to the temple with bhabhi maa. Gayu thought to get some gift for Kaartik. Nairra came there and asked her to buy something for herself. They got saw the things for themselves. Bhabhi Maa asked Naira and Mishti to wait as unmarried girls could not go to that place. Some goons came there and asked Naaira to give money. 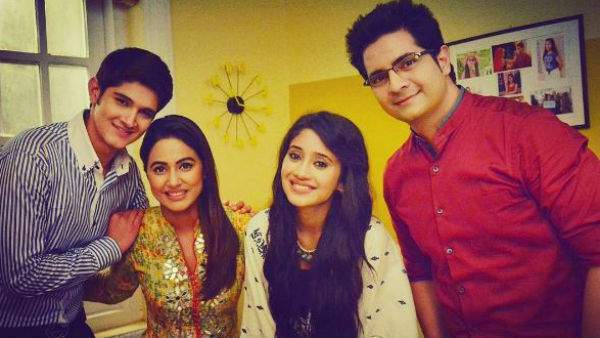 Check: Yeh Rishta Kya Kahlata Hai 25th October 2016. She gave away her jewelry. They asked her to give a ring. She denied. The goon was about to hit her with the stone. She said that Kartik gave that ring to her and she would not give it to anyone. She realized that she loved him and cried. She beat up the goon. The men there then helped her. Naira cried seeing the ring. She thought of Karrtik. She ran on the road. She danced. She reached home and called out Kartik. She called the office and asked for Kartik. Naira came back when they tell her that he was not in the office. Gayu and Nairaa both looked for Kartik. Mishti thought that he did not come and he had to go to Delhi too. Nairra thought how to stop Kartik from going. Naitik had to go to the office to talk to Kartik, but Naira asked him not to go and ask him to call him at home only. Naitik agreed. He called the office and asked the manager to send Kartik home. Kartik came home. Gayu smiled seeing him; Naitik asked him to come in and sit. He said sorry for calling him urgently at home. Kartik gave his agreement and stated that he had some points. Naira came there wearing the gown that he got for her. Kartik looked at her and got surprised. Naitik complimented her. Naaira smiled seeing him. Naitik blessed Naira. He went to take some file. Naira walked towards him. Kartik looked at her. She kept on smiling while looking at him. Naira thought to express her feelings but Rukmani came there, and she stopped. Naitik came back and got the file he needed. Naira thought to tell him after pooja.